Barberries are the edible, dark red fruits of the spiny barberry shrub. The berries are a close relative of the Oregon grape, and are native to Europe and Asia. Barberries can be seen growing wild from Canada to Pennsylvania. The plant’s bright yellow flowers start to bloom between April and June, and produce berries in the fall. Barberries are characterized by their oblong shape and acidic flavor, and typically ripen in late summer or autumn. The fruits come in many names including mountain grape, pepperidge, and common grape. The fruits are known to contain medicinal properties and have been used for over 2500 years in Asia and the Mediterranean region. The berries have also been used by ancient Egyptians to ward off plagues. Likewise, Ayurveda healers — who hailed more than 3,000 years ago from India — turn to these fruits to address dysentery. Barberries are known for their cardiovascular benefits. Berbamine, a compound found in the berries, is known to protect the heart from ischema and damage due to oxygen deficiency. The powerful compound is also found to improve the contraction of cardiovascular muscles. Aside from this, the berries’ soothing effects are known to relax blood vessels and regulate potassium movement in the body, in turn helping maintain a healthy blood pressure level in the body. The berries are also found to soothe the digestive tract and reduce stomach inflammation to alleviate stomach upset and acidity. Likewise, barberries improve appetite. The berries’ antimicrobial properties are found to treat diarrhea as well. Barberries also have beneficial effects on the liver. Barberries are known to promote bile secretion and liver detoxification, keeping the organ in top shape. Additionally, a previous study showed that barberries helped reduce the levels of triglycerides, bad cholesterol, fasting insulin and glycosylated hemoglobin in participants. This suggests that barberries may stave off the onset of type 2 diabetes. 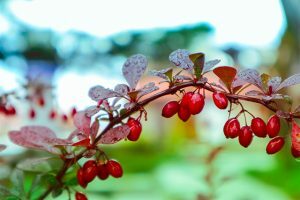 In addition, barberries are notably effective in promoting white blood cell formation, thus fortifying the body’s immune system and fending off infections. The berries’ anti-inflammatory properties can keep respiratory tract infections — such as colds, coughs, and bronchitis — at bay. Barberries also contain anti-rheumatic properties that alleviate pain and symptoms of rheumatism. Likewise, certain compounds found in barberries are touted to ease body pains such as sciatica and lower back pain. The berberine enzyme in barberries is known for its anti-convulsive properties that help treat epilepsy. Likewise, certain alkaloids in barberries are known to ease fever and malaria. Barberries can also treat eye conditions, skin infections, and menstrual issues. Barberries are especially beneficial in promoting healthy digestive, immune, cardiovascular, respiratory, nervous, urinary, and female reproductive systems. Likewise, barberries support the overall health of the eyes, skin, and joints. Barberries can be used in various recipes. In fact, the berries are versatile enough to be added to certain rice dishes. Online recipe curator MyRecipes.com features a sumptuous rice recipe using barberries. Aside from this, barberries can also be used in sweets such as tartlets. Barberries prevent cardiovascular diseases, digestive issues, and microbial infections. Barberries treat kidney issues, respiratory conditions, epilepsy, and rheumatism. Barberries benefit the digestive, immune, cardiovascular, respiratory, nervous, urinary and female reproductive systems. Barberries benefit the overall health of the eyes, skin, and joints.